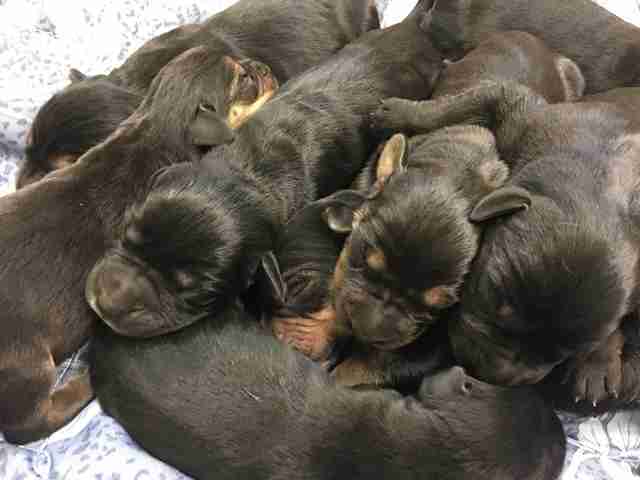 Someone was out for a walk one day along a path in Vermont he came across a box along the side of the path - with nine abandoned puppies cuddled up inside, their umbilical cords still attached. 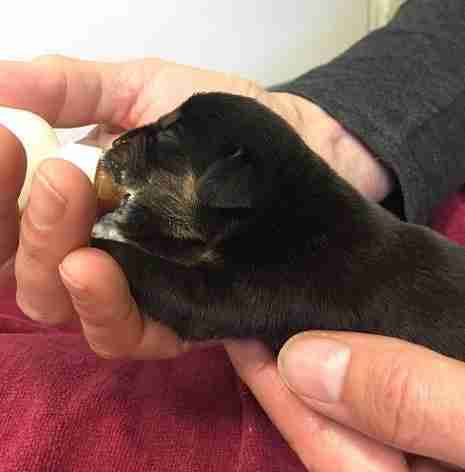 The puppies had clearly been born just hours before, and the Good Samaritan knew they needed to get help immediately. He brought the puppies to a small local shelter, but it didn't have the resources to care for puppies that young, and so staffers contacted the Central Vermont Humane Society (CVHS) to see if it could help. "Within a few hours of being discovered, they arrived at our shelter, and we had prepared a room in our shelter specifically to care for them," Erika Holm, director of operations at CVHS, told The Dodo. 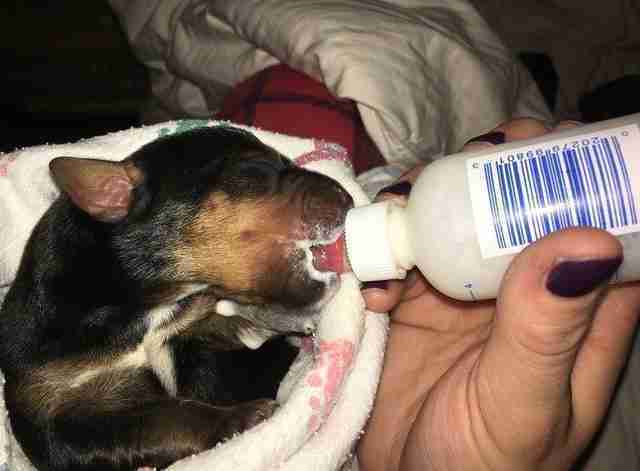 "We immediately started bottle- and syringe-feeding the wee pups, and figuring out a plan to make sure they were cared for around the clock." Unfortunately, there's no way to tell what happened to the puppies' mom, and so far there's been no sign of her. CVHS has put out an alert to veterinarians across the state, and has asked that if anyone comes across a dog who could be the mom to immediately let them know. "No one saw these puppies being dumped, and nothing about their condition gives us any clues to what happened to the mom," Holm said. "We hope she is alive, and safe. 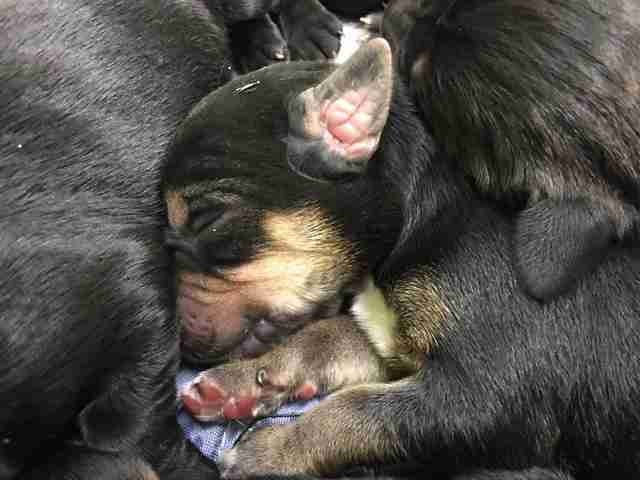 We feel for her, and the pain she must have experienced when her puppies were taken from her." The puppies seemed to be doing OK when they arrived at the shelter, but the staff is still wary of their condition and know that with puppies this young, things can take a turn at any moment. They have to be fed every four hours and are manually stimulated to pee and poop. Because the puppies require so much effort and care, staffers and volunteers alike have been working around the clock to make sure they are given the best possible chance at growing into healthy, happy dogs. "We are optimistic, but still being realistic about their chances," Holm said. "There are a few small ones, who definitely get more individual attention to keep them on track, and a couple pretty chunky ones. We all know their condition can change at any moment, but each day they survive makes us a little more confident about our chances of success." The puppies are now 10 days old, and are still fighting to survive. Unfortunately, one of the puppies didn't make it and passed away on Friday morning. While everyone is mourning this loss, staffers and volunteers are staying positive and continuing to work to help the eight remaining little fighters. It will be quite a while before the puppies are available for adoption, but eventually the hope is that they will all be strong enough to find loving forever homes. If you'd like to help take care of these darling puppies, you can donate to the Central Vermont Humane Society to help finance their care.